You will have had to have been living under a rock for the last few weeks or months to not have realized that developer Niantic has started a gaming phenomenon with Pokémon Go augmented reality game. Built using Unity 3D, the interactive augmented reality based game has managed to pull in millions of worldwide users in what seems to be a very small amount of time. The game itself is addictive enough, but you can always rely on the community to release additional packages to make it ever more entertaining. We will be looking at the best iPhone and iPad tweaks, tips and cheats available right now, with some of them requiring users to be jailbroken. If you are keen to get involved in the interesting and addictive world of Pokémon Go, but are using a jailbroken iOS device, then you could be in for disappointment. Like a lot of apps, and specifically gaming releases, the developers have added jailbreak detection into the codebase of Pokémon Go, which means that if you’re jailbroken you are fresh out of luck. However, if you install the PokePatch tweak, it will help circumvent the native jailbreak check. You can grab it from the developer’s personal repo here: ryleyangus.com/repo. And then enjoy playing Pokémon Go on your jailbroken device! If you are loving everything that Pokémon Go has to offer, but simply don’t want to have to explore the surround environment by actually physically walking places, then PokemonGoAnywhere is probably the right package for you. With this jailbreak tweak installed, you can cheat by simply tapping anywhere on the display to make yourself walk to that location. What’s more, it also looks as though additional functionality and power will be added over time. The tweak is available from the developer’s personal repo here: www.williamlcobb.com/repo. There are few things more annoying in the world than finishing a hard day at work, wanting to explore the Pokémon world and catch some exceptionally rare Pokémon, only to find that the servers are being hammered so brutally that they’ve given up and taken themselves offline. Now, with the installation of FlappyGo jailbreak tweak, you can wait for those servers to come back up by passing the time with a game of Flappy Bird without having to leave the app. The tweak can be installed from the developer’s personal repository here: repo.ziph0n.com. If you’re willing to disable the passcode on your iOS device, and are perfectly happy to have your battery absolutely annihilated, then you can now play Pokémon Go directly on the Lock Screen of your iPad or iPhone thanks to the Pokemon Lock tweak. If you need to cure that addiction, but really don’t have the energy or desire to unlock your device, find the Pokémon Go app and launch it, then this is a must-have jailbreak tweak for your device. But be advised, that this only works with the passcode disabled. The tweak can be grabbed from the developer’s personal repository here: repo.ziph0n.com. A free app available for iOS and web (coming soon to Android) features a crowdsourced map that helps Pokémon Go players find Pokémon near them. More details on it can be found here: Find Pokemon In Pokemon Go The Easy Way With This Crowdsourced Map. In all of the excitement that comes with signing up for a Pokémon Go account, you could be forgiven for stopping to wonder what kind of access would be provided to the developers of the app if signing in with an existing Google account. It turns out that creating and signing in with a Google account provides developer Niantic with permissions akin to that of Google’s own Chrome account, which, in short, means total account access. You can of course prevent that by following out guide here: Pokemon Go Is Getting Full Access To Your Google Account, Here’s How To Fix That. Update: This issue has been fixed now with an update to iOS app. Read more on it here. A new app on iOS that allows Pokémon Go players to easily find PokéStops, Gyms, and rare Pokémon nearby on a map. You can learn more about this app here: Find Pokemon Go PokeStops, Gyms, Rare Pokemon Maps Location With This App. Not only is it a game, but it’s a game that’s extremely graphics intensive and also makes regular use of the device camera and GPS sensors to provide real-time location tracking services. It stands to reason that all of those things combined are going to have a negative effect on the device battery. This one doesn’t actually require you to be jailbroken, but our guide can show all users how to enable the app’s built-in Battery Saver mode to preserve precious energy: Enable Battery Saver Mode In Pokemon Go On iPhone Or Android, Here’s How. A developer has found a way to extract game data directly from the Pokémon Go app and has then used it to plot it on Google Maps. You can learn more on how this trick works here: This Pokémon Go Hack Extracts Data From The Game To Show Pokémon On Google Maps. Here is a cheat sheet list of all 151 Pokémon in the game, complete with species stats (type, height weight, attack, defense and stamina) to help you in your Gym battles. More details here: Pokemon Go Cheat Sheet: Species Stats For All 151 Pokemon In The Game. How? Here’s how: Find How Much You’ve Walked Playing Pokemon Go, Here’s How. Pretty cool trick that actually works: Pokemon Go Tip: How To Earn XP Faster & Level Up Quickly. Getting “Our servers are humbled by your incredible response. We are working to resolve the issue. Please try again soon!” error? Check server status here: Pokémon Go “Our Servers Are Humbled By Your Incredible Response” Error; How To Check Server Status. To help you catch ’em all: This 3D-Printed Pokemon Go iPhone Case Ensures Perfect Poke Ball Throws. Near trick: How To Play Pokemon Go In Landscape Mode. Yes you can: Pokemon Go Trick: Get Unlimited Incense & Lucky Eggs, Here’s How. Is Pokémon Go app crashing for you after jailbreaking your device on iOS 9.3.3? 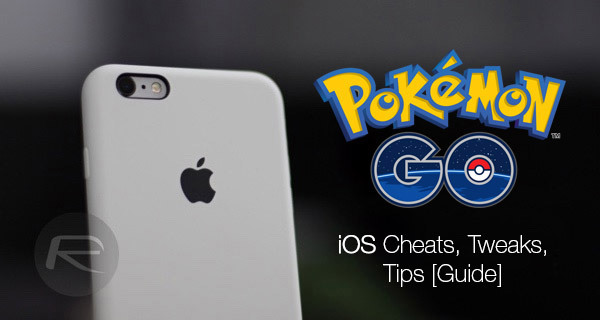 Here’s how to fix it: Fix Pokemon Go App Crashing After Jailbreak On iOS 9.3.3, Here’s How. This is pretty useful: Poké Assistant Features Eight-In-One Pokemon Go Tools To Help You Catch ‘Em All. Got your Pokémon Go account soft-banned? Here’s how to get it back: How To Unban A Banned Pokemon Go Account. Got a permanent ban on your account? You’ll need to submit an appeal to get it unbanned. Here’s how: Got Permanent Ban On Pokemon Go Account? Submit Appeal To Unban It, Here’s How. Looking for alternatives Pokevision which Niantic killed recently? We have got you covered: The Best Pokevision Alternatives For Pokemon Go On iOS, Android, Web. iOS user? Do yourself a favor and install this free app! It will send you a push notification whenever you are nearby critters in the physical world: This Pokemon Go App Sends Push Notifications To Alert You Of Nearby Critters. Android user? Follow the instructions here: Get Push Notifications For Nearby Pokemon In Pokemon Go With PokeAlert For Android. Looking for PokéAdvisor alternatives? Here are our best picks: The Best PokeAdvisor Alternatives For Pokemon Go. What is a IV Calculator? How can it help you in the game? Which one should you be using? All these details can be found at: The Best Pokemon Go IV Calculator Apps On Web, Mobile. While officially the game is only available on iOS and Android, that doesn’t mean those with Windows phones can’t have some of the fun. There’s now an unofficial port of Pokémon Go available which can be downloaded from: Download Pokemon Go For Windows 10 Devices [Unofficial Version]. Want to know the max CP (Combat Power) of Pokémon? Find it here: Max CP (Combat Power) Of Pokemon In Pokemon Go Revealed. Want help in hatching 10km, 5km and 2km Pokémon eggs? This chart can help you: Pokemon Go Egg Chart For Hatching 10km, 5km, 2km Eggs. This is a hacked version of the game with popular cheats built-in. You can download and install the latest version for both iOS and Android from here: Pokemon Go++ 1.15.0 / 0.45.0 Hack Is Out, Download From Here. A new trick that can help in throwing Poke Balls much easier. Details can be found here: Pokemon Go “L Throw” Trick Makes Poke Ball Throws Easier. Tips to fix the dreaded “GPS Signal Not Found” error when playing Pokémon Go: Fix “GPS Signal Not Found” Pokemon Go Error On iOS Or Android [Tips]. >> just search “pokemon go royalcheats” on google. 14,5k PokeCoins just added to my account! You should check this sit! Free PokeCoins! You should check this site! Free PokeCoins! I am glad that I am not one of you people. It is so out of control!!! I can’t get the verification code to work on hacktoid 🙁 signed up for ALL the offers and the download still doesn’t work!! LOL. Thanks but no thanks. I am not into Pokemon anyway. You guys gonna do something about this spam? I have a jail broken and I was able to get pokemon to work. Just have to install a few tweaks. Enjoy! They also include video tutorials there!!! !